Leporidae is always growing and some features are under development. Keep this in mind before registering. Leporidae is an online multiplayer rabbit breeding and showing game. 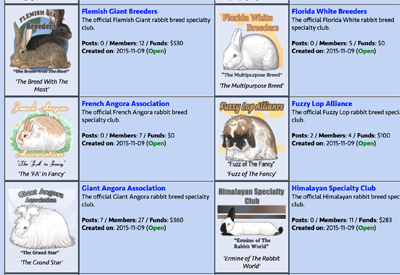 Raise your own virtual rabbits, buy and sale from other players, and compete for awards. 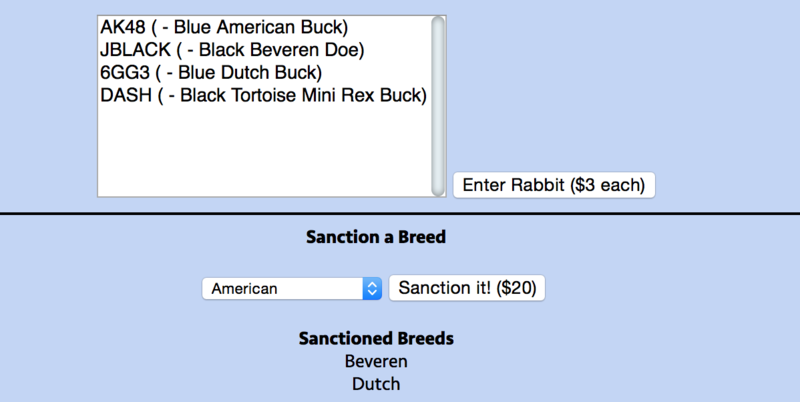 There are over 60 breeds to choose from on Leporidae, including all United States breeds, foreign breeds, and fictional breeds! Which one(s) will you choose? Meet the Polish, a small, compact breed with bold eyes; and the Czech Frosty, a white rabbit with a stocky body and thick ears. Leporidae genotypes accurately mimic real life inheritance! We have all our bases covered (get it?) from BB x Bb to advanced combos. Our system includes genetic modifiers that control color and pattern variation within the same genotype. With all of the different colors and vartaions, there are millions of possibilities. 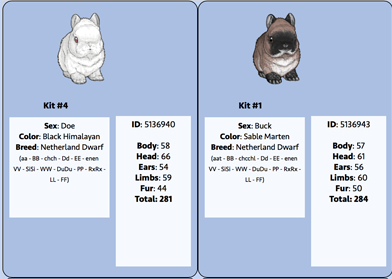 These two Broken Chestnut Netherland Dwarfs have the same genotype, but different coat patterns due to hidden genetics. Each real life day equals one month on Leporidae, so breeding rabbits will result in a litter the next day. Try to guess which color they are when they're first born! Start sorting out your keepers at any time while they're growing. You can view other players' litters and reserve the ones that are put up for pre-sale, or sell your own. It's all about watching your litters grow and deciding who to keep! Enter your rabbits into shows to compete against other online players. Rabbits are judged based on their inherited stats and how closely they come to meeting their breed's standard. Win Best of Breed, Best in Show, and other titles, and earn sweepstakes points through your breed's club. Rabbits that win frequently enough may become Grand Chamopions! There's a club for every breed, which you can join and even be elected as a club leader. Clubs are a great way for breeders to come together, share ideas, and help improve their breed and community. You can also join or run player-made clubs. Meet and compete with other players from around the world! Discuss sales, share ideas, and make friendss through chatting, forums, clubs, and private messaging. Leporidae has its own player-made economy and community. Personalize your account with custom avatars! Avatars will appear on your profile and on the forums when interacting with other players. There are many avatar icons to choose from, or use one that you made yourself. Dress uyp a human avatar with wearables that can be purchased and collected. Buy and sell clothes with other players, fill your wardrobe, collect, and show off your personalized style! 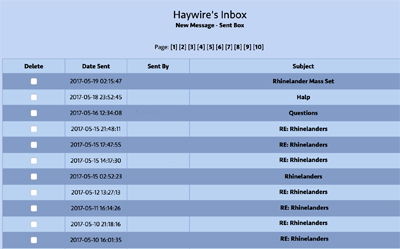 Organize your rabbitry in a way that suits you! From feeders and cages to entire buildings, choose who and what goes where, label, and decorate. There are six building types to choose from to put your bunnies in, and lots of options for painting buildings. Once you have your building, you can fill them with cages, hutches, or pens of your choosing. Then equip your rabbits' individual housing with feeders, waterers, stickers, and more.